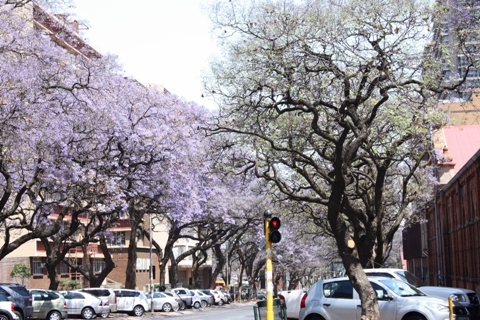 I recently visited Pretoria for the first time since we moved here, partly with the idea of taking pictures of the beautiful jacaranda trees that are currently in bloom. 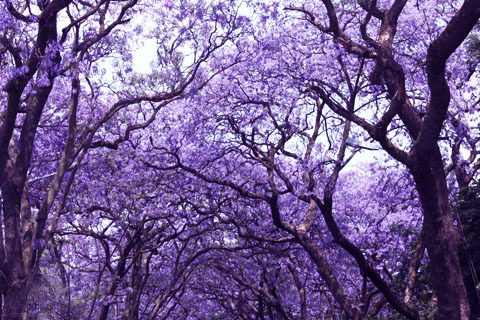 But it turns out Johannesburg has plenty of jacarandas as well, equally stunning. In fact, things have conspired so that I just happen to have gotten an excellent Photoshop tutorial by my friend and fellow blogger Bing, and I’ve applied a little bit of what she taught me to the pictures in this post. 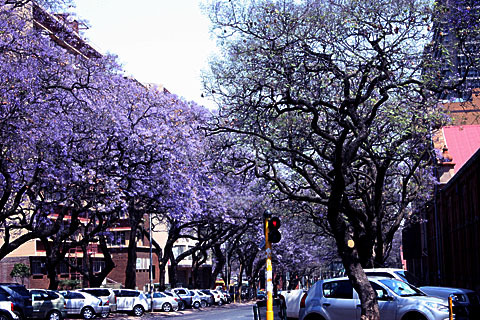 So now you’ll think the Joburg jacarandas are much more beautiful than the ones in Pretoria. To shoot these pictures, I joined the Joburg Photowalkers for the very first time, and we took a stroll around Rosebank. 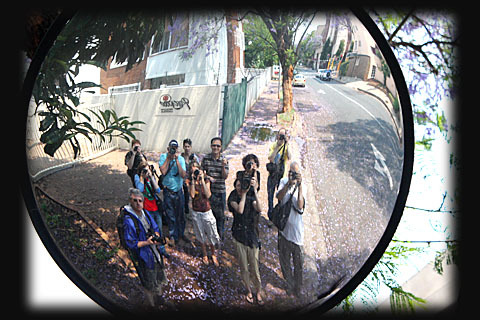 The Photowalkers are a great way to explore Joburg, especially if you’re a bit apprehensive about some areas of town and want to tag along with people who know their way. And they’ll also share the odd photography tip with you! 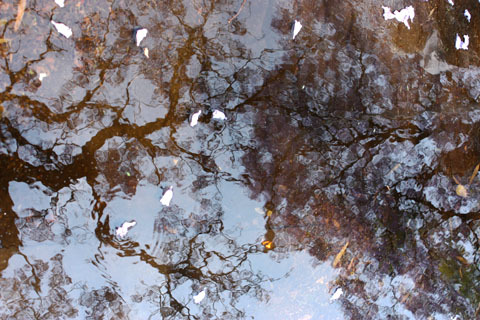 When everyone started taking pictures of reflections, I found this puddle. I love the result! 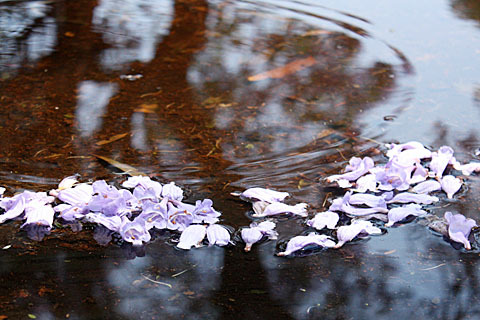 An interesting tidbit: did you know that jacarandas are not indigenous to South Africa? They were imported from South America in the 1880s but through their sheer numbers have become a South African icon. 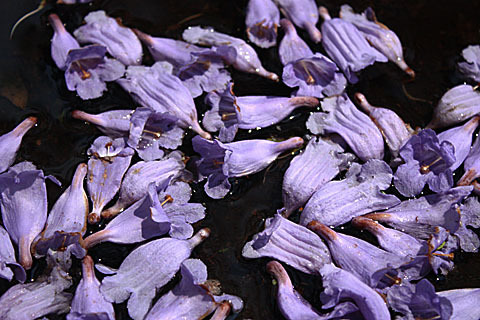 In an attempt to limit invasive species, the South African government has banned certain plants, and the jacaranda sadly is on that list. 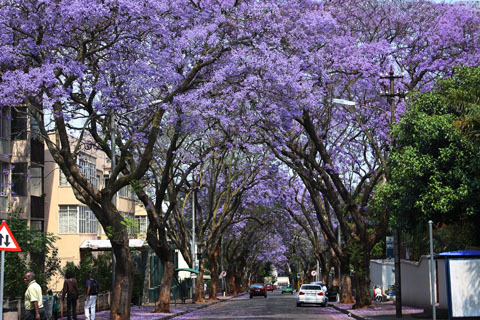 But at least it’s not forcefully removed, as some other species (I think if anyone ever tried to remove jacarandas from our beautiful cities there would probably be serious civil unrest). You are simply not permitted to plant any new ones. Sigh – one of these would look beautiful in our yard! Looking back at these pictures, I must admit Photoshop (I got the student version, much cheaper) makes a huge difference. I’ve only just scratched the surface of all the amazing things you can do with it, but I’m also a bit reluctant to delve into it any deeper because I can sense a new passion taking over my life! Where to take the time? Previous PostPrevious I’m REALLY pissed! Next PostNext How Many Cattle does your Household Own?